WowMovix is not a program that you should use to manage your downloads or to acquire free online access to various movies or TV shows. Even though it is advertised in such a way, you must know that it is just a marketing gimmick used by its developers. Such manipulative technique is employed in order to lure unsuspecting Internet users into thinking that they are obtaining a useful tool. Unfortunately, there is much more to this program than you might think. Malware experts at our internal labs have classified it as an adware application after conducting an in-depth analysis. During the research, it has been found out that this ad-supported program will mostly ruin your only experience by causing numerous disruptions while you are surfing the web. If that was not enough at times it might even operate in an alarming manner; sometimes it could even expose your operating system to dubious web content. We firmly advise you to delete WowMovix if it is found running on your PC since it could turn out to be a major virtual threat. Follow the instructions that we present below and get rid of it in the quickest way possible. WowMovix at the moment affects only the Google Chrome browser. Even though the compatibility is narrow, you should be aware of this adware application since its developers could launch a newer version of it, which might turn out to function on other popular browsers. Once it enters your operating system, it immediately implements its intrusive third-party extension. Such activity is not that different compared to other unwanted programs that are classified in the same way. 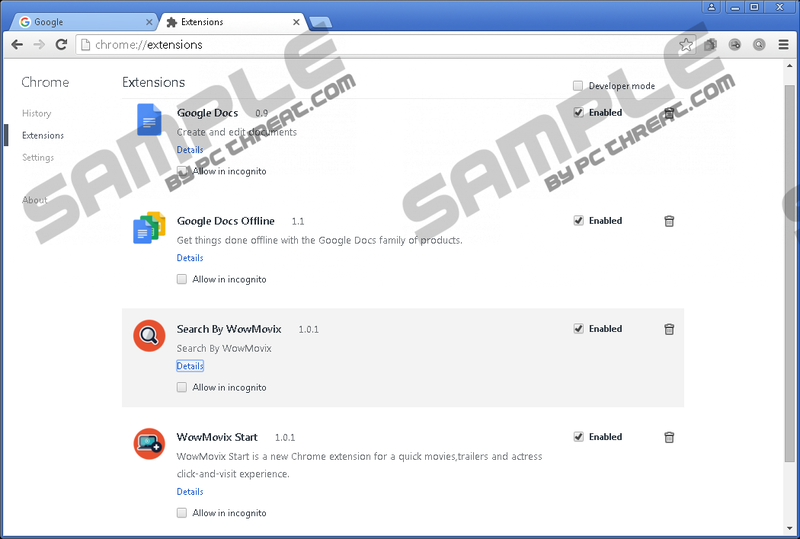 The extension plays a major role in the overall performance of this ad-supported software as it triggers connections to various adware servers. Such servers primarily serve as providers of unwanted web content, which usually manifests itself within your web browser as commercial ads, pop-ups, and coupons. Unfortunately, these contentions to such dubious servers cannot be terminated easily. The intrusive activity will bother you for as long as this adware program is fully present on your computer. It is important to delete WowMovix right now if you wish to restore the normal performance of your web browser. By leaving it active on your computer, you will continue to be annoyed and might even put your operating system at risk. While ads and pop-ups presented by WowMovix might be its most annoying feature, it must be highlighted that in some cases it could work in a potentially dangerous way. Our team of malware researchers has come across dubious content that this ad-supported program presents. You must be aware of the fact that at times you could be provided with an ad or a pop-up implemented with a redirect link. Just clicking on such an ad is dangerous because you could be redirected to some unknown third-party site. It is impossible to determine where you could end up. There is a possibility that you could be taken to fake online shops crafted by cyber criminals in order to steal your credit card data or sites that might be the source of dubious or even harmful software. If unfortunately you already have WowMovix operating on your computer we firmly advise you to check your PC to be sure that there are no other questionable applications active. Even though ads and pop-ups embedded with redirect links are not an often occurrence, it remains a possibility to come across one. For as long as this ad-supported program is active on your computer your operating system remains at constant risk of getting infected. Every security-conscious user should delete WowMovix without second thoughts. Terminate it by following detailed instructions that we provide below. The removal of WowMovix must be executed as soon as it is found running on your computer. Do not take any chances and delete it in its entirety. This is crucial as just a few leftovers could have detrimental outcomes. For instance, the adware application might be restored if just a few files or registry entries associated with it are still present on your PC. This is the reason you should run a full system scan with a reliable antimalware tool once you have executed the removal procedure. Click the Chrome Menu button select Settings. Click the Trash can icon next to the unwanted extension. Select Remove to confirm your choice. Quick & tested solution for WowMovix removal.